This morning was to see one of the toughest challenges. 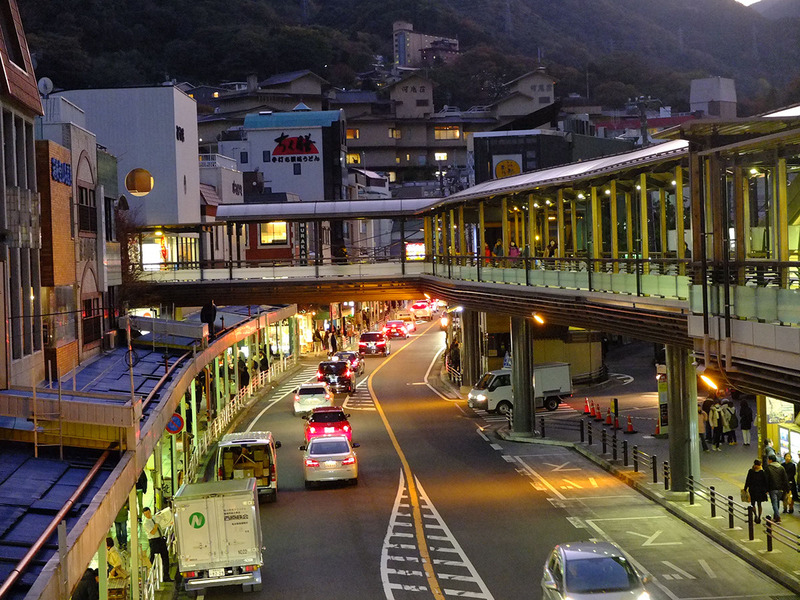 Getting from Shinbashi to Hakone-Yumoto in just an hour. A day trip to Hakone was quite pressed for time, more so that it was imperative that we arrive at Moto-Hakone by the lakeside before at least 10 am if we wished to have a chance at seeing Mount Fuji. 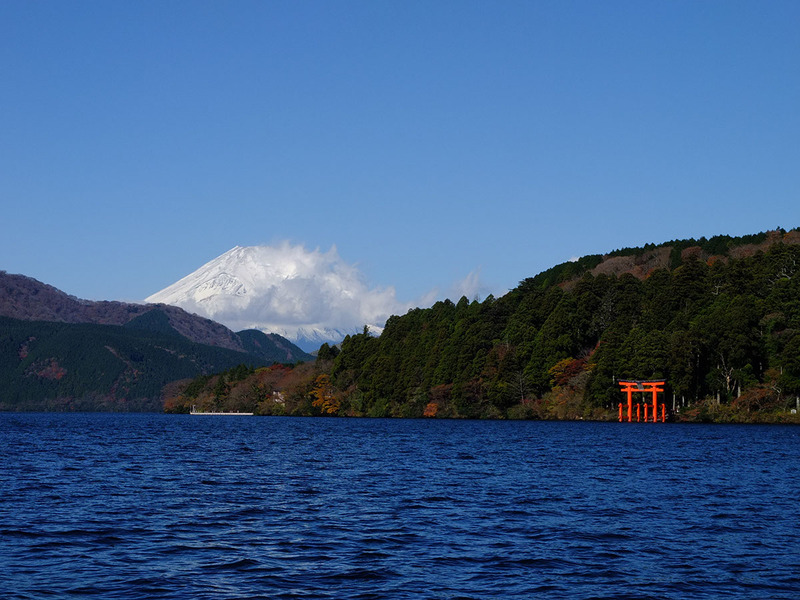 Mount Fuji is also called the shy mountain because its peak is often shrouded by clouds. The best time to have a clear view of it is during the early morning or evening when the temperature is cool, during the day clouds often form and like a hat obscure it from view. Studying the live cameras over several days it appears clouds most often start to form after 10am. There’s also a bottleneck crossing Lake Ashinoko from Motohakone on the south side to Togendai in the north, with one boat every 40-50 minutes, catching just one boat earlier can make a huge difference in the schedule down the road. This means getting to Hakone as early as possible. Even half an hour can make a lot of difference. 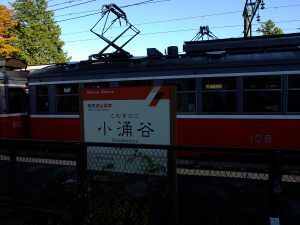 The earliest train from Shinjuku is an Odakyu express departing at 7am and takes an hour and 40 minutes, arriving at Hakone-Yumoto at 8:40. If one then first take the mountain railway to Kowakudani (since it may be dark by the time we descent, taking the railway in the morning ensures we get to enjoy the sights), then transfer onward to the bus, one should reach Moto-Hakone at 9:45. 7am is quite early especially for a station as large as Shinjuku. Assuming one’s hotel is at Shinjuku, accounting for walking time and navigating the station, this means leaving the hotel at latest around 6:30~6:40. 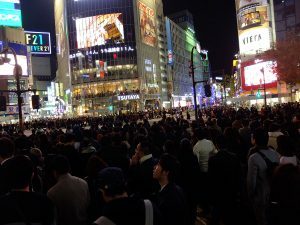 Earlier if one did not stay at Shinjuku. The next express out of Shinjuku is 7:27 and arrives at Hakone-Yumoto at 9:01, which gets to Moto-Hakone at 10. This was a source of headache when choosing where to stay. 7am train is really early and there’s a risk of oversleeping it. If it’s the next train then arrival in Hakone will be a bit late. Until I found an alternative. Before that though it’s worth looking into why departing from Odakyu is considered the default. 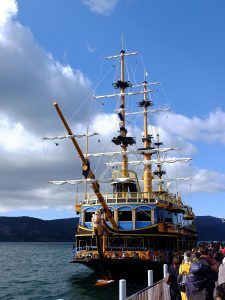 Transport around Hakone is dominated by the Odakyu group. 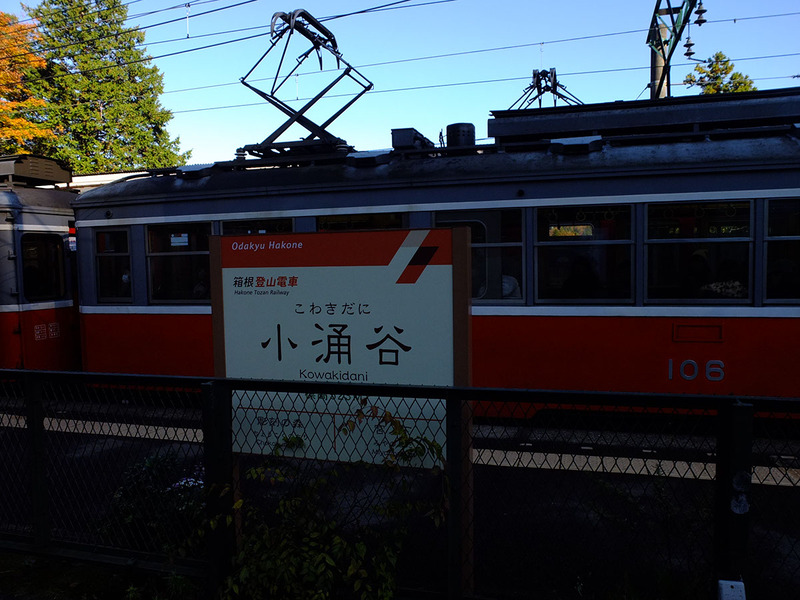 Odakyu is one of the major private railways in the Kanto region, its main line connects Shinjuku to Kamakura and Odawara, Hakone. In addition, the group also owns the Hakone Mountain Railway, Hakone Cable Car, Hakone Ropeway, Hakone Sightseeing Cruise and most of the local bus in Hakone region. 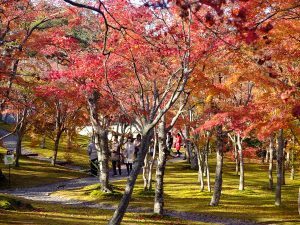 The Hakone Pass issued by Odakyu allowed tourists unlimited access to all transports in the Hakone region for just 4000Y, and for another 1140Y also included a single regular return ticket from Shinjuku. A small trap with the pass is that the return ticket is only valid for non-express trains which required transfers and takes about 2 hours. To take the express trains one has to purchase another 890Y to get an express ticket, 890×2 (1780) for return. All up this means 2920 extra or about 1460 each way. Going to Hakone effective means having to get a Hakone pass, the natural outcome is to also get the return from Shinjuku as one single simple solution. 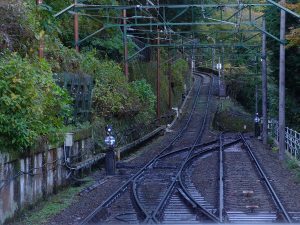 Since most people chooses this way, various guides and blogs also discusses only this way when concerning how to get to Hakone. But while Odakyu is the only choice within the Hakone region, it is not the only choice getting from and to Hakone from Tokyo. There is also JR East whose local train (there are no expresses) takes about 70~80 minutes between Tokyo and Odawara, and the shinkansen which can cover that distance in just 35 minutes. 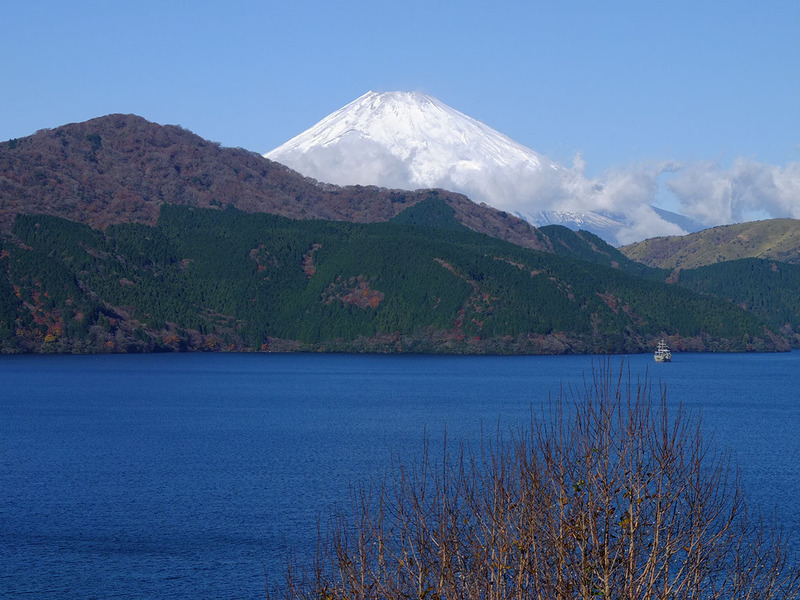 From Odawara one can use the basic Hakone pass up to Hakone-Yumoto (another 20 minutes) and onward. The JR East train costs 1490 one way, which is actually comparable to Odakyu. The shinkansen on other hand while being extremely fast, costs 3220 each way. The JR East train can be an alternative but did not solve my problem of getting to Hakone early enough. 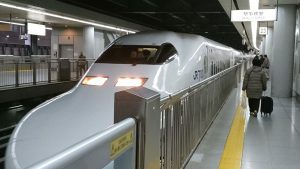 The shinkansen was too expensive, until I found that JR Central sold a special outing ticket called Shinkansen Odekake-Kippu, where one can purchase returns to Odawara for 2 people travelling together for just 4630 per person, or effectively 2315 each way. It’s still >800Y more each way compared to Odakyu but brings it into the bounds of reasonable trade-off worth considering. Once I discovered this possibility I started charting out possible timetables. Catching the shinkansen from Shinagawa was the best choice since compared to Tokyo station it would shave ~10 minutes off again from the time one has to leave the hotel in the morning. 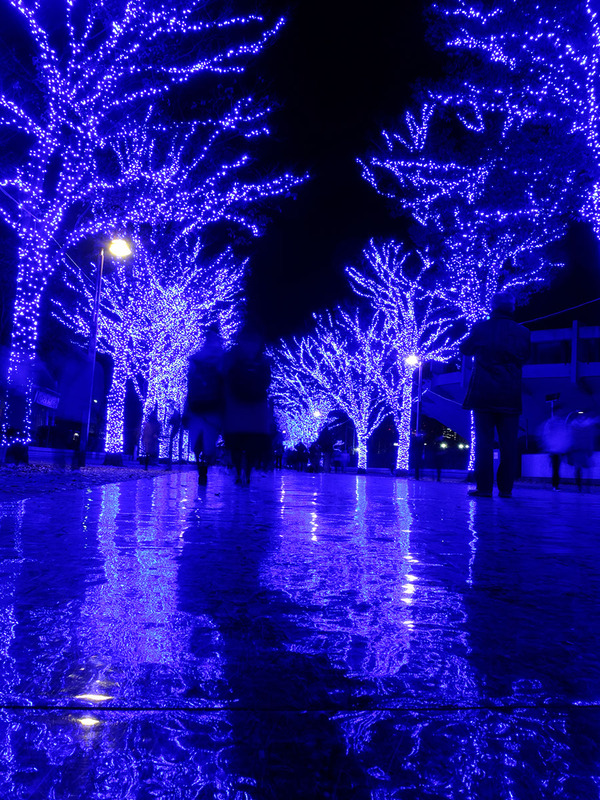 That left any stations close to Shinagawa (there are very few hotels around Shinagawa), such as Shinbashi. I charted out every train for each segment of the transfers. 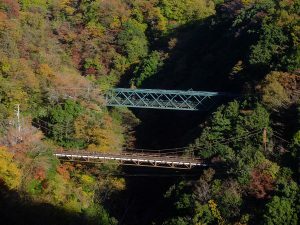 Shinbashi>Shinagawa, Shingawaga>Odawara, Odawara>Hakone-Yumoto, Hakone-Yumoto>Kowakudani, Kowakudani>Moto-Hakone. From the table a precise transfer could be worked out. Based on the station layouts it was very tight but definitely doable. 7:15 Shinbashi departure, 10 minutes transfer at Shinagawa, 5 minutes at Odawara, arrive at Hakone-Yumoto at 8:21. Then 3 minutes to walk up the platform onto the mountain railway (once this transfer is made the trip is safe), with arrival at Moto-Hakone at 9:25. The transfers are too tight to show up on transfer apps like Jorudan or Ekitan, have to be worked out manually. 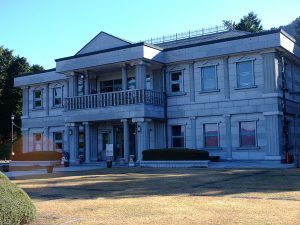 Compared to Shinjuku departure on the 7am Odakyu express, we can leave at least 15 minutes later (more since Shinbashi station is small, only need to account for time from the hotel) but will end up at the lakeside actually 20 minutes earlier. The day began with Super Hotel’s breakfast. Breakfast here started at 6.30, I went down right on the minute. We had agreed to meet in the lobby at 7, until then it’s up to each when to have breakfast and anything else to do. One thing I love about Super Hotel is that their breakfast is always familiar but never the same. The food is very consistent no matter which location, one knows exactly what to expect yet won’t know what one might get. There’s a few things that are certain. 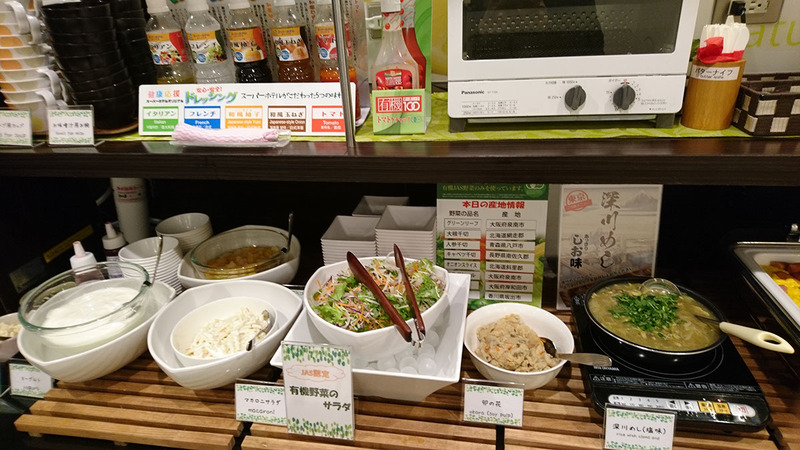 Selection of coffee from the machine, organic salad with range of Super Hotel’s signature sauces, yoghurt, fruit, bread, rice and sides that go with it such as nato, pickles, miso soup. There will be a fish dish. The fish may not be the same nor may it be cooked the same way. I don’t know whether it’s company policy but I have yet to have one without fish. There will be an egg dish. The egg also may not be cooked the same way but there will be eggs. Then there will be a meat dish. Plus one or two other dishes that varied. 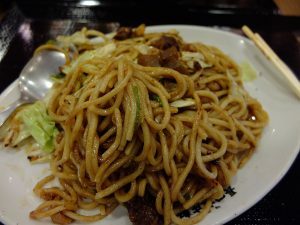 Many branches tend to also have a “local” dish, a dish unique to that Super Hotel or Super Hotels in that region. It could be curry, miso topping…etc. 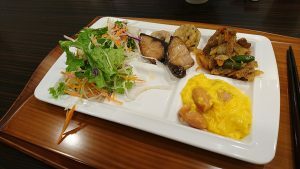 The specialty of this Super Hotel was Fukagawa-Meshi, a clam rice stew. Super Hotel’s breakfast leaned on traditional Japanese breakfast, this requires comparatively more effort. Other business hotel usually provided just scrambled eggs, weiners and maybe hashbrown or potato, items that can be much easily prepared. It’s one reason why I chose Super Hotel since Y is not used to western style bread or sandwiches. The transfer went smoother than planned. At Shinagawa we had to wait for the Nozomi currently on the platform to clear out first before the Kodama showed up. I had already checked the best car number for transfer and we boarded car number 7. 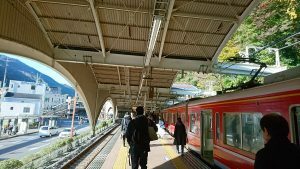 The tightest transfer was Odawara, with just 5 minutes to go up the platform, exit the Shinkansen gate, up the main concourse then through the Odakyu gate and down to the platform and board the train. It’s my first time to Odawara, though I had checked the station layout on youtube things could look different on arrival. We made it with about a minute to go. Had no need to run. But would not have made it if I had not purchased ticket beforehand. On the train from Odawara to Hakone-Yumoto we met a pair of Chinese old couple who came from the States. 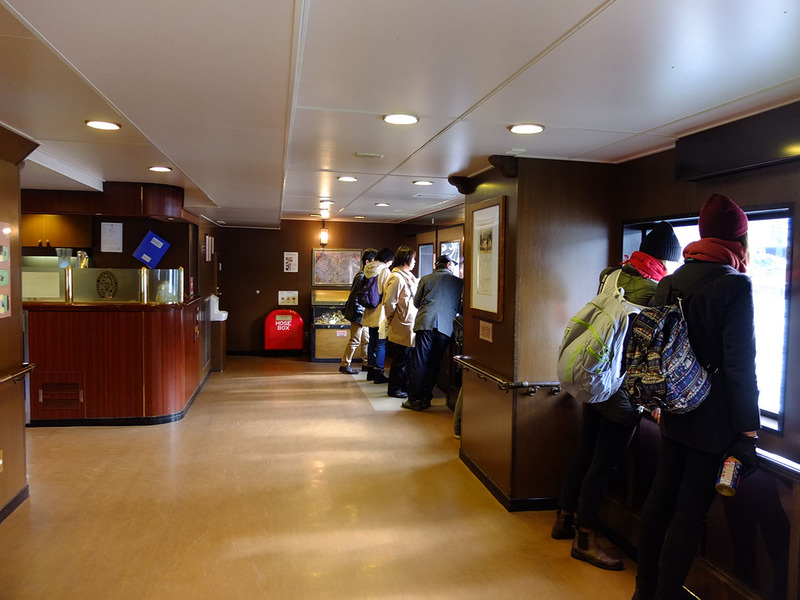 They seemed to have bought the Hakone mountain railway+bus pass at a whim and had not yet looked at what to see and do at Hakone. So they asked us what was our plan and whether we had any suggestions. I outlined our plan of taking the railway up to Kowakudani and transferring to the bus, doing a clockwise loop around the area. 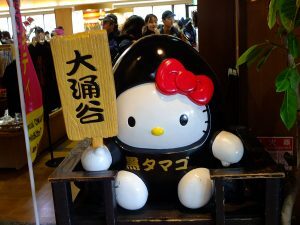 They seemed to like the idea and followed us up till Moto-Hakone. 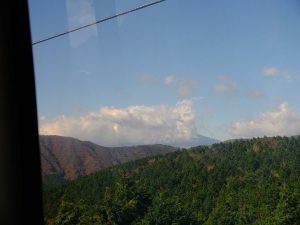 Once we got on the mountain train at Hakone-Yumoto we no longer had to worry about transfers and the sightseeing begins. 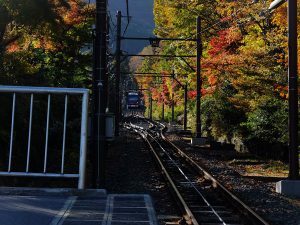 The Hakone Mountain railway is the Japan’s oldest mountain railway and the steepest railway in Japan without a rack rail. 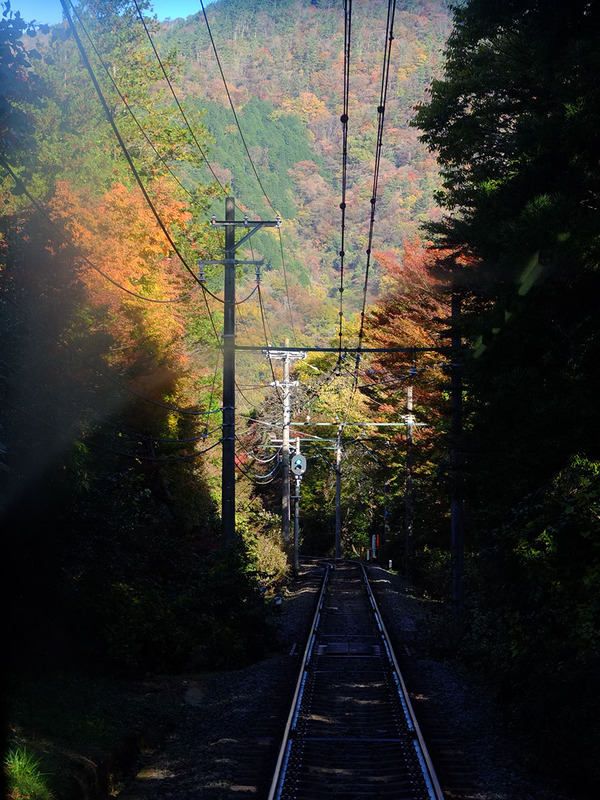 In less than 10km it climbs from Hakone-Yumoto at 108m to Gora at 556m. 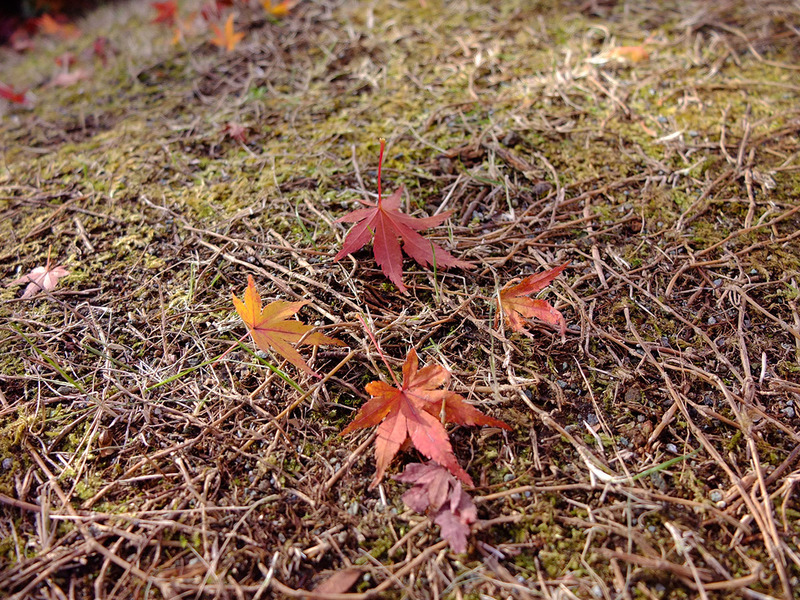 The leaves close to Hakone-Yumoto was still green, which I took to be a good sign that there were bound to be red leaves along the way up. Along the tracks there are 3 turnbacks to navigate the steepest inclines.The turnbacks also doubled as a passing stop for trains coming the other direction, there was plenty of time to take in the view as we waited for the descending train or for the poor driver to run to the other end to drive the train in the other direction. 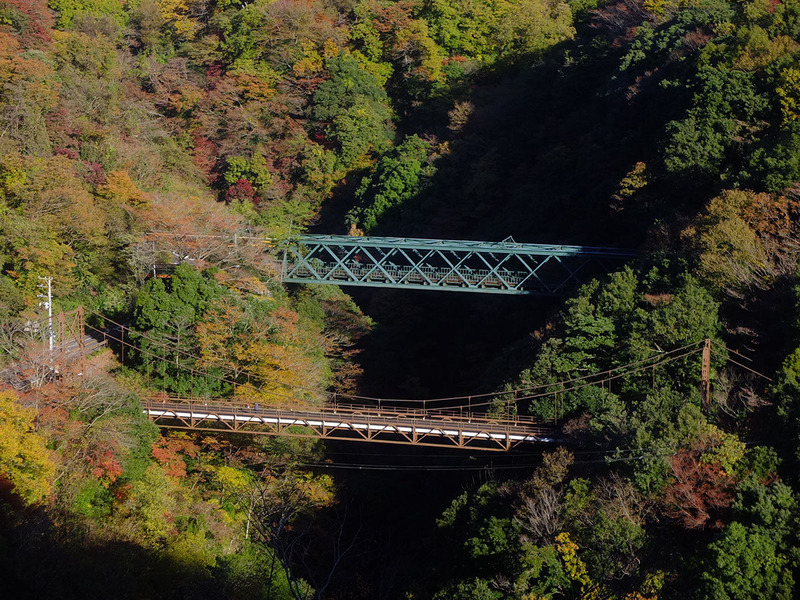 The train winded through narrow tunnels and bridges over steep valleys. Only in the old days could a railway be built through terrain as difficult as this only for access to tourist destination. Two stops from Gora we got off at Kowakudani. This was the station where the railway and the bus route headed for Moto-Hakone diverged. Originally the bus was not due for another 12 minutes and Y had begun to wander off when a H route bus turned around the corner. Is the bus early or the previous one late? No matter, I hurriedly called Y back. 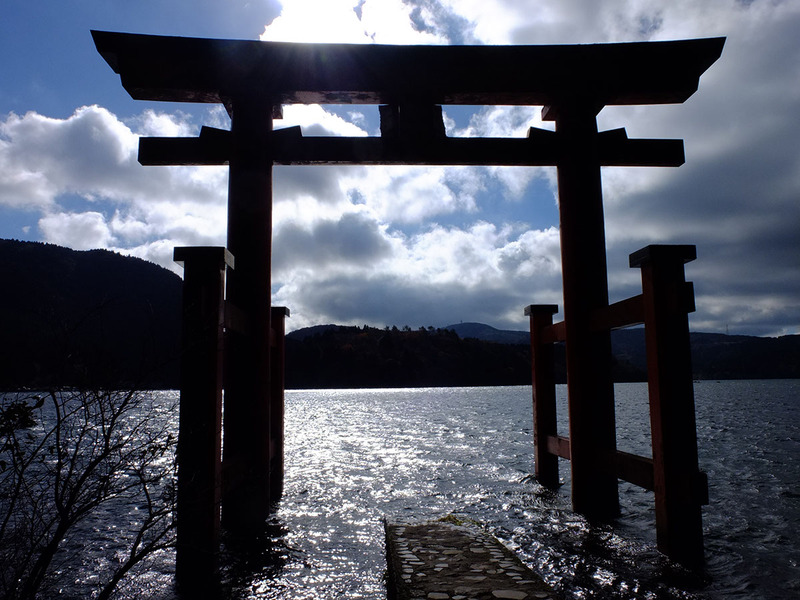 Since the bus came early we now had time to go to Onshihakone park instead of just Moto-Hakone. 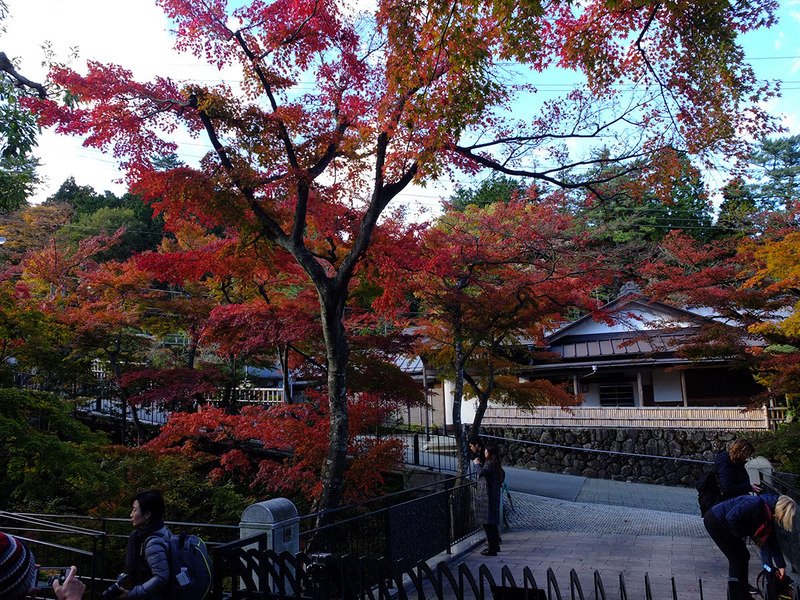 Onshihakone was about 500m further down the Lake Ashinoko south bank and used to be the Emperial family’s vacation palace. It’s a small peninsula jutting out into the lake and from its higher elevation offered a fantastic view of Mount Fuji and Lake Ashinoko. 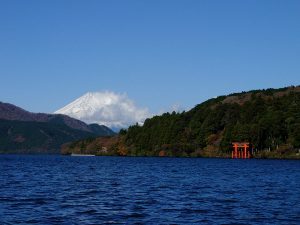 The poor weather over the last few days had cleared up, in the distance Mount Fuji loomed over the pristine lake. 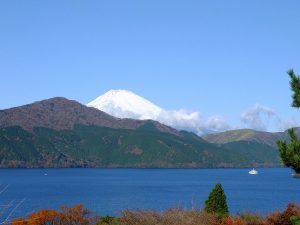 I had been very worried about whether we would be able to see Mount Fuji today and was very relieved. Thanks the the early bus we were by the lakeside at 9:15. The main structure in the palace grounds is a western style hall. 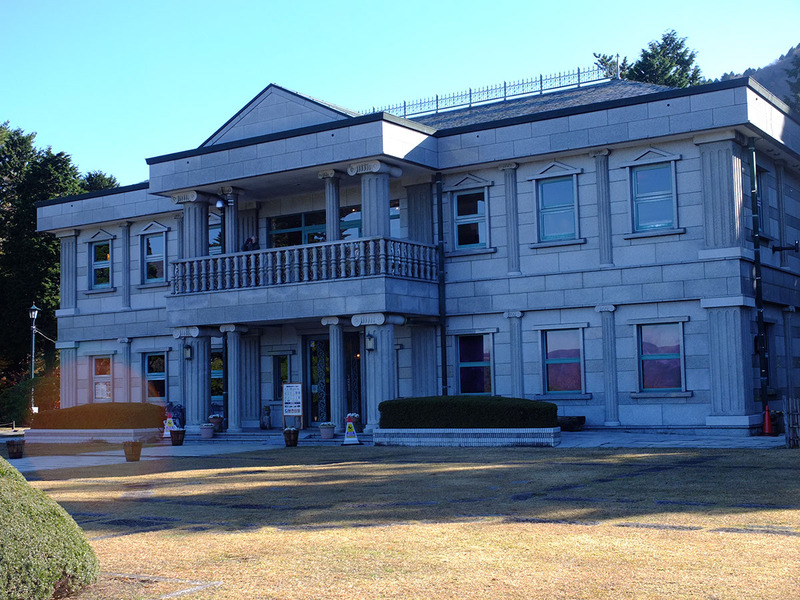 There used to be an Japanese style Hall adjoining the western Hall but after destruction in multiple earthquakes had been reduced to a small wooden building. From the 2nd floor balcony of the Hall one had a clear view of the lake and the far shores. 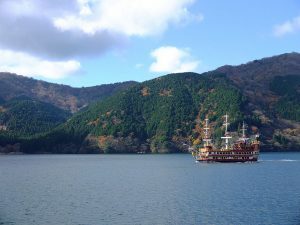 A pirate cruise ship leaving Moto-Hakone glided into view before turning north toward Togendai. There was another small viewing platform in the park where high magnification binoculars were installed. 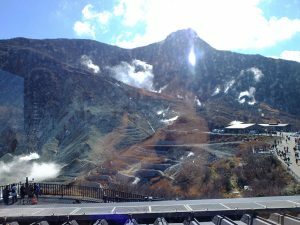 Through it we could see the smallest valley on Mount Fuji, the snowy slopes glistening in the sun. Between Onshihakone and Moto-Hakone is a length of forest path which used to be the old Tokaido postal road. 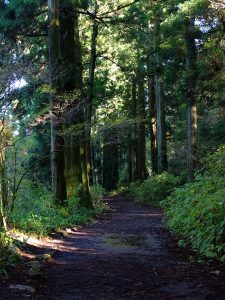 The ancient road is lined with 400 years old giant cedar trees. 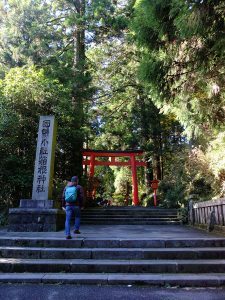 Hakone had long been a vital town due to its status as a major checkpoint controlling travellers heading in and out of Kanto. 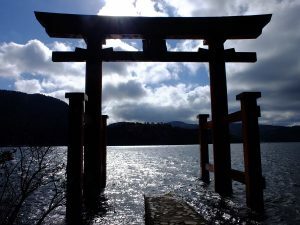 The old checkpoint that had been reconstructed is at Hakonemachi, not far in fact from Onshihakone, unfortunately it was one of the many placed that had to be left out due to the tight schedule. Cedar Avenue was actually less exciting than it sounded, being a stone throw away next to the main road with cars constantly whizzing by definitely took away its atmosphere. 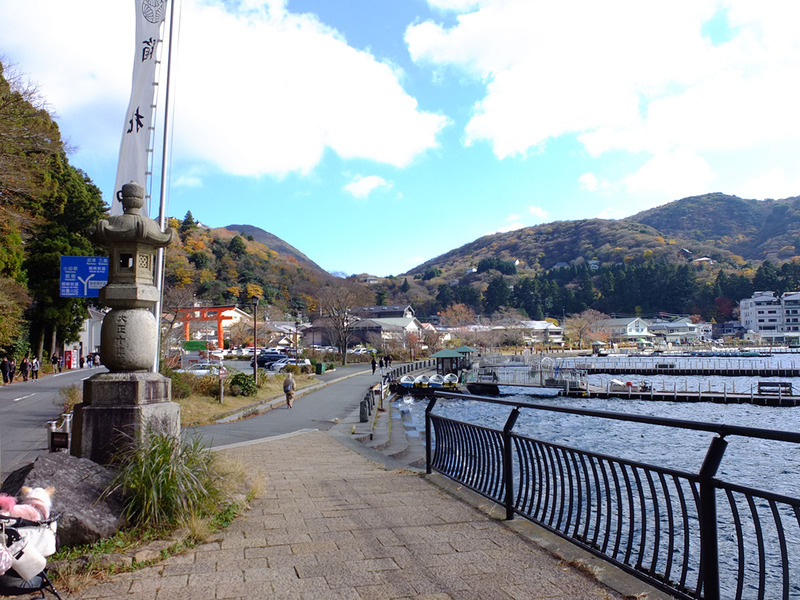 We got back to Moto-Hakone and continued along the waterfront to Hakone shrine. The Hakone shrine used to be on the summit of Komagatake, related to mountain worship. It was later moved down to the foot of the mountain. The shrine is best know by its torii the stood in the lake at the bottom of the stairs. The tourists were out in force now, plenty of traffic going to and from the shrine. 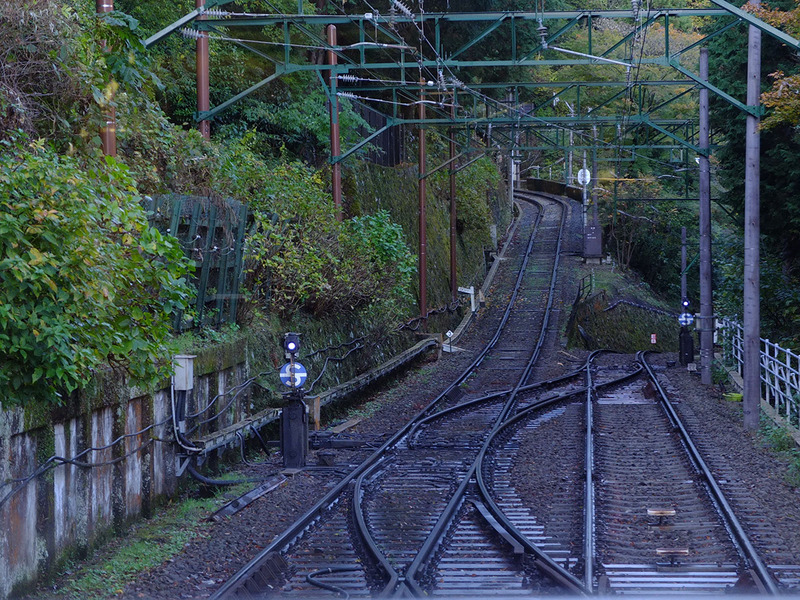 I had taken some measures to avoid the two main bottlenecks in Hakone. The cruise ship and the ropeway. The cruise ship departed to a fixed timetable and if there were more people than allowed it was a 40min wait for the next one. 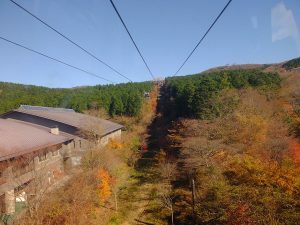 The ropeway similarly had limited capacity. It’s said that sometimes traffic gets so backed up it could take an hour just to get on the ropeway. Coming on a weekday avoided the most heavy traffic, and doing the Hakone circle in a clockwise direction (official recommendation is anti-clockwise) means we go against traffic and can manage time more effectively in the afternoon since we would already be past the bottlenecks. I’m actually not sure why the recommendation is anti-clockwise since Mount Fuji is best viewed in the morning. We had to hurry for a bit on the way back to catch the 10:50 cruise ship. At first I was a little worried as there were already quite a few packed on the pier. I needed not worried, the ship was maybe 1 /2 full, based on the licensing plaque the boat had a capacity of over 500 people, not sure if they would actually pack that many people onto it in peak season, the boat already a little crowded today. The boat had 2 levels plus an open top deck and also partitioned into front and back. The front was the first class section which required an extra 500Y one way. From the photos it didn’t look like it was much of an improvement other than the front view. In peak season it may be a way to get away from the crowd in the back. 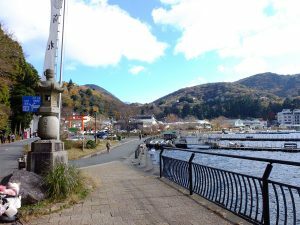 The journey from Moto-Hakone on the south bank to Togendai on the north takes about 30 minutes. 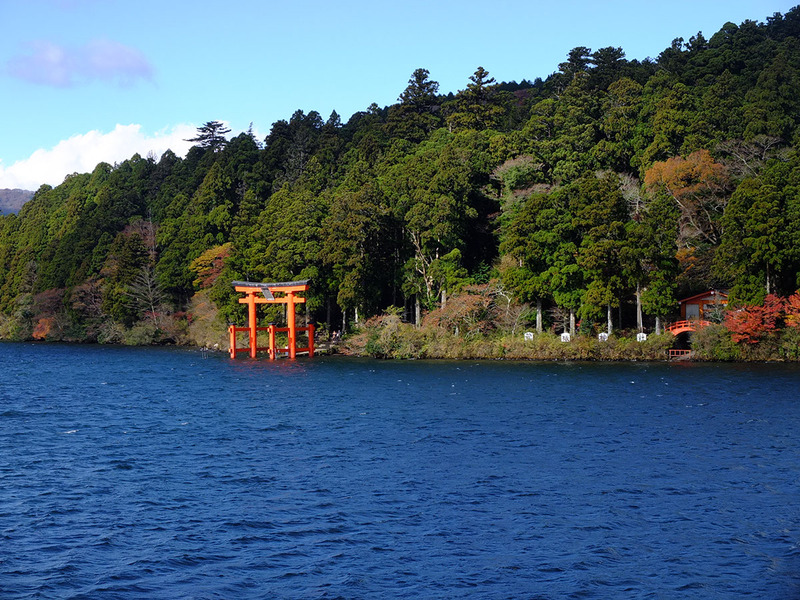 From the boat one could see all the sights around the lake, like Hakone shrine, the ropeway climbing up Komagatake and various hotels and resorts dotted along the banks. 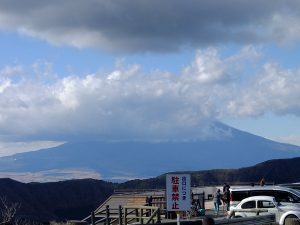 By now the clouds had gathered on Mount Fuji and its peak had disappeared. Fortunate that we had come early. 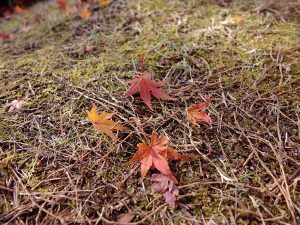 The autumn leaves had passed for the forests on either side of the lake, only a smattering of lingering red left amongst the brown barren woods. On the open lake the wind blasted across the decks. I gripped onto the camera tightly for fear of it being blown overboard. Y had already retreated below to safety and warmth. Despite my struggles I too had to go downstairs. 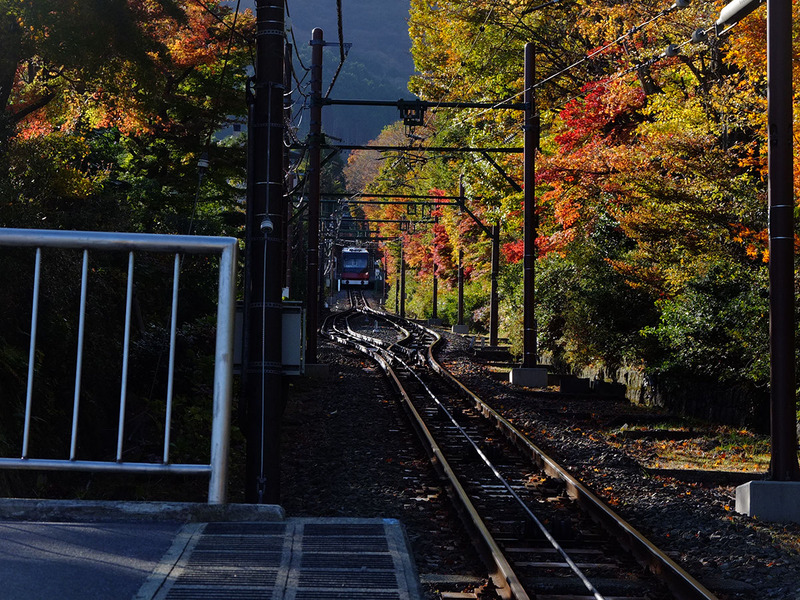 Togendai is the western terminus of the Hakone ropeway. 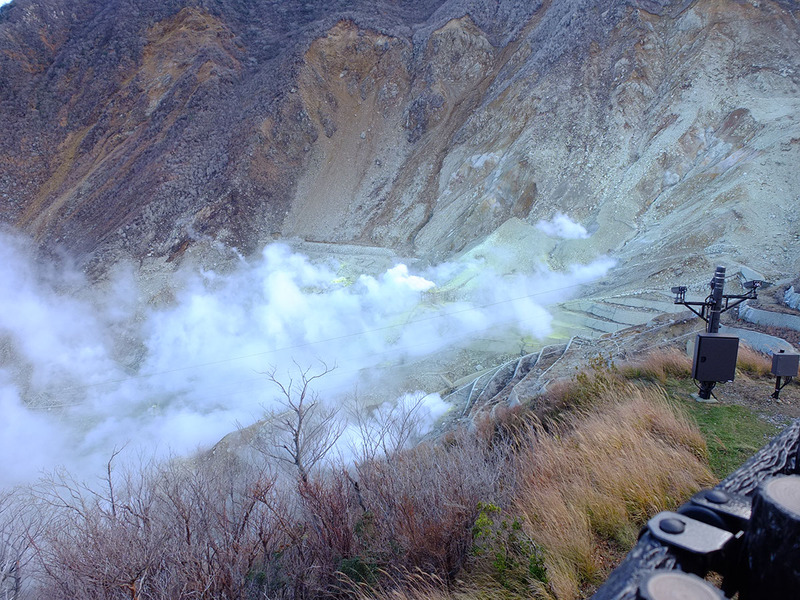 The ropeway goes from Togendai up to Owakudani, active geothermal area at the top of the crater. 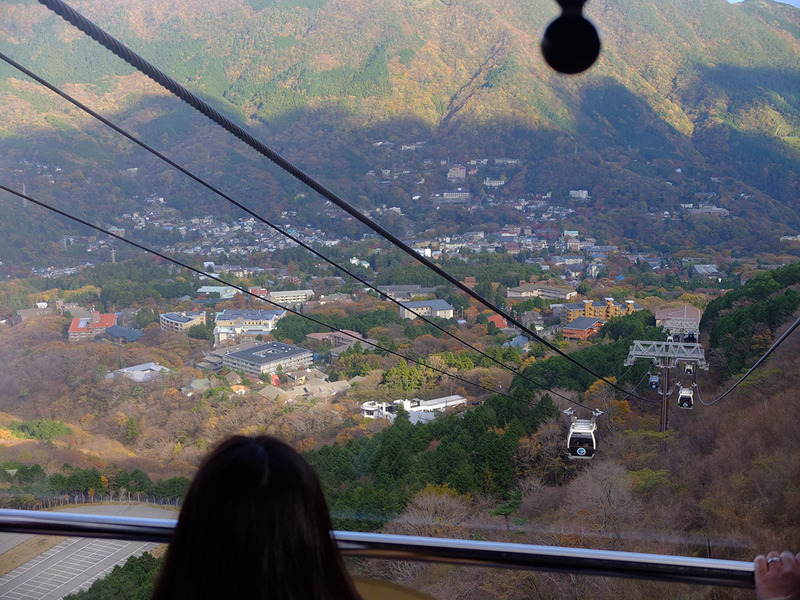 The ropeway had one of the largest gondolas I’ve seen, able to seat 18 passengers at maximum. Since it’s not a particularly busy day the staff chose to fill each with only 10-11 people. 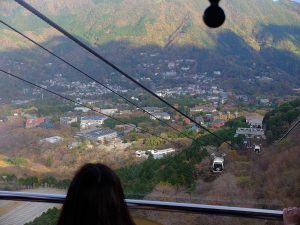 The ropeway had a steep and exciting climb, rising quickly up into the air and gave great views of the lake. 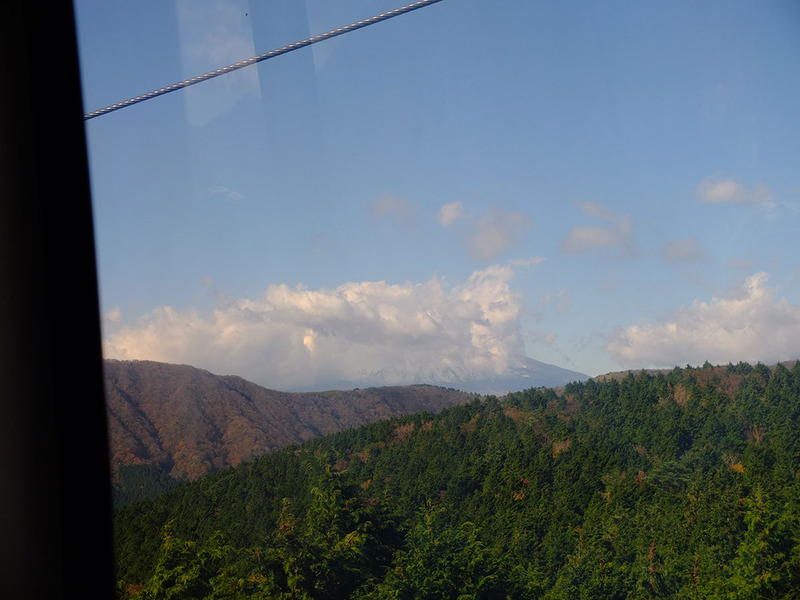 The ropeway also offered a majestic view of Mount Fuji on good days, today the mountain was shrouded and all we could see is the wide rolling foothills beneath the sea of clouds, which is also very impressive in its own ways. 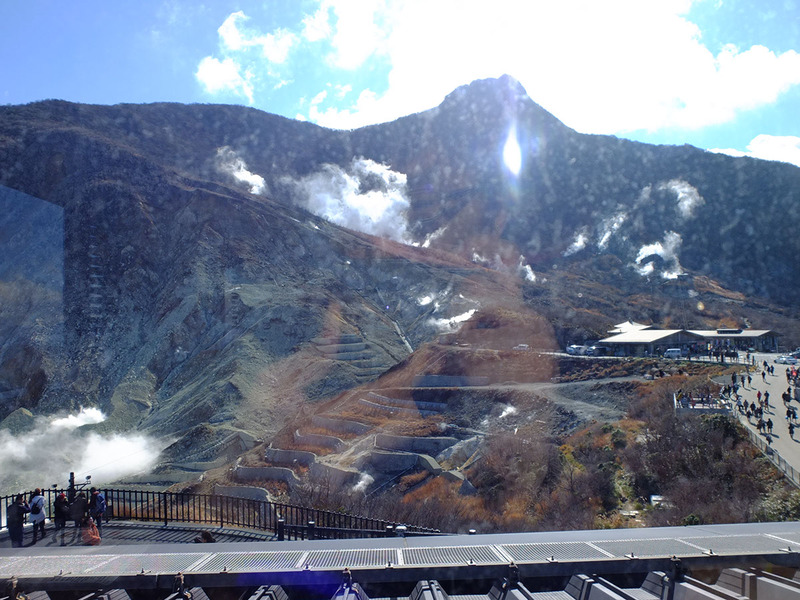 We reached Owakudani and was immediately greeted by the cold and sulfuric air. 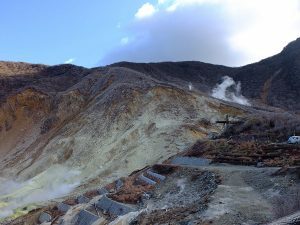 Owakudani was still under level 2 alert, meaning the area was experiencing more volcanic activity than usual and the geopark trails around Owakudani was off limits to tourists. 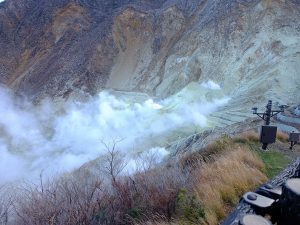 A year ago the ropeway was even closed due to too much noxious gas spewing out the crater. Since it was nearing 12 we decided to have lunch. 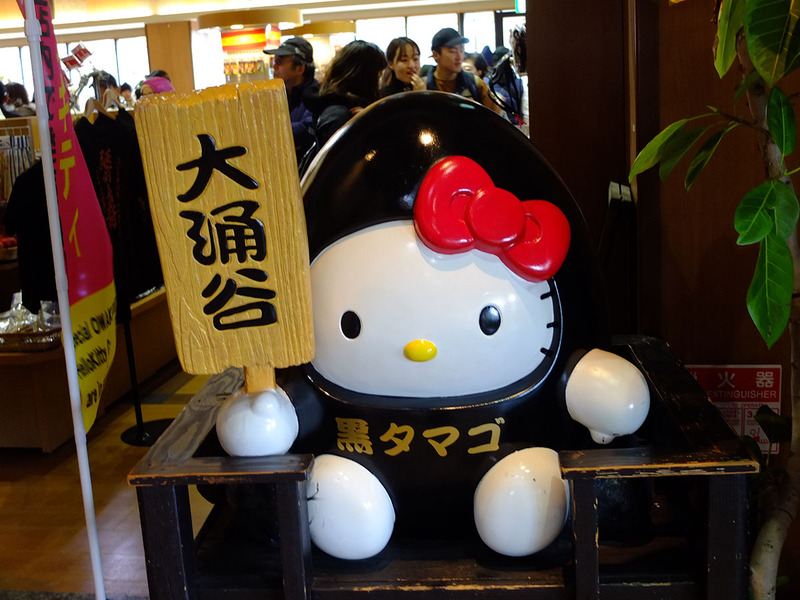 Food options in Hakone is fairly limited. Outside of cafe and eateries there were only 2 good places to eat around Gora and those usually had lines outside, so anywhere was as good as any. Having lunch here allowed the most flexibility overall, there was no need to backtrack and no pressure to eat quickly to get to the next spot. The eatery attached to Owakudani ropeway station has a very simple menu, probably due to its hard to access location. Curry rice or chips and fried chickens. 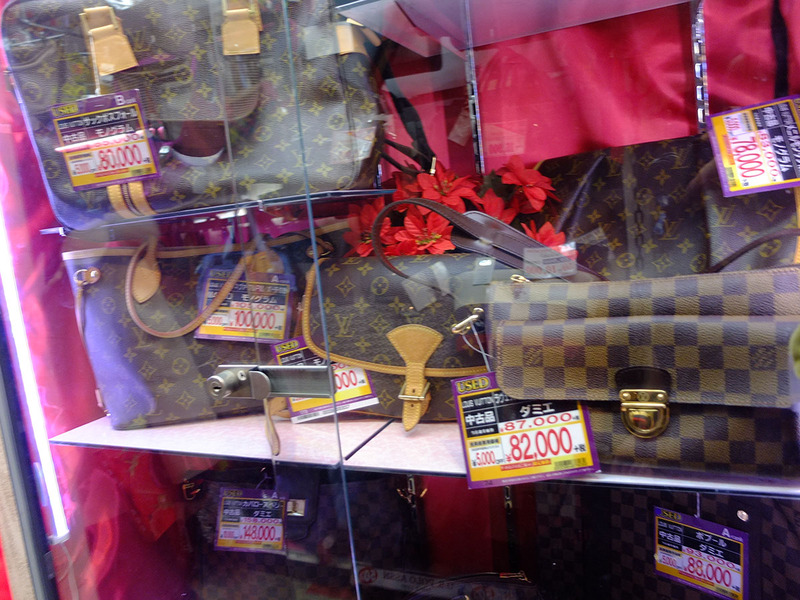 The price is on the expensive side like most places in Hakone. It’s still before proper lunchtime, we were able to pick a window seat overlooking the crater energetically spewing steam, a view worth the extra price (probably). The crater is also where ryokan and hotels in the area make their onsen water. 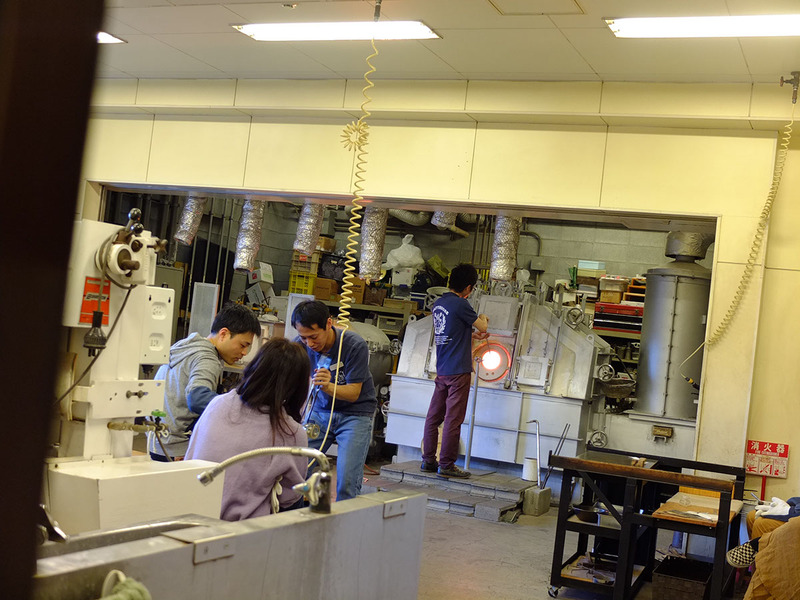 Many of onsens in the Gora and Senseki area actually gets their onsen water via manufacturing. By directing water over/into the crater’s steam vents minerals are dissolve in the water, the infused water is then piped down to the ryokans. 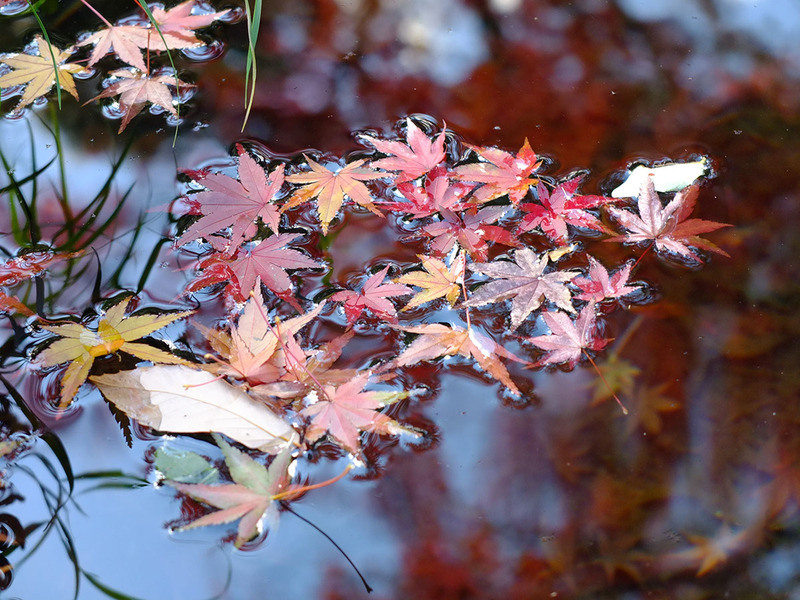 Whether these qualify as natural onsen is up for each. Just something nice to know. Personally this makes it possible to control the mineral concentration which leave me a little wary. 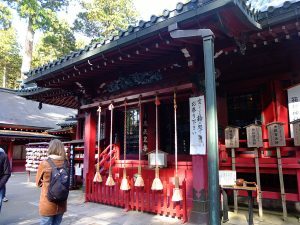 Beitou onsen in Taiwan also uses the same method to produce onsen water. When we left the restaurant there was at least 6-7 groups waiting, having wrote their name on a list and have to wait for the staff to call them. 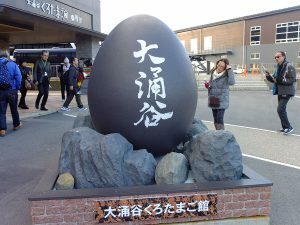 A specialty unique to Owakudani is the black eggs. 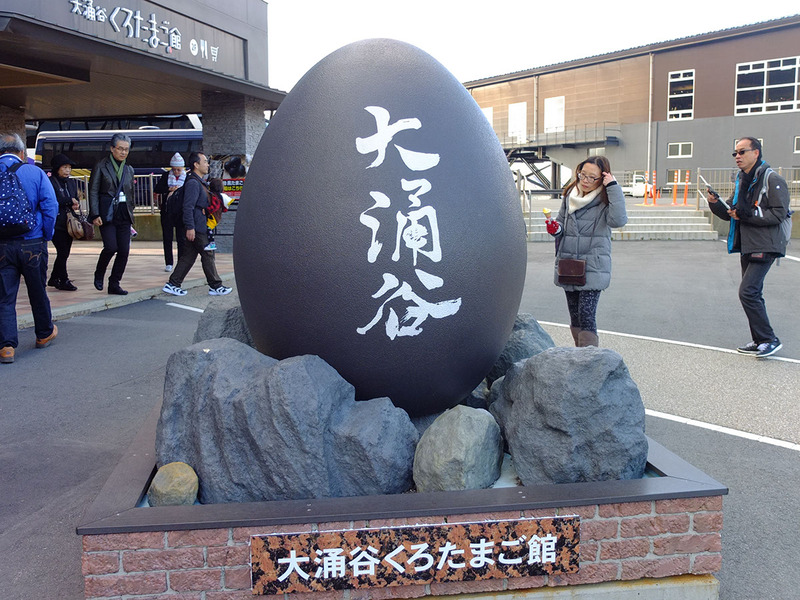 They’re regular hard boiled onsen eggs but the egg shell reacts to the volcanic water and turns into a charcoal black. 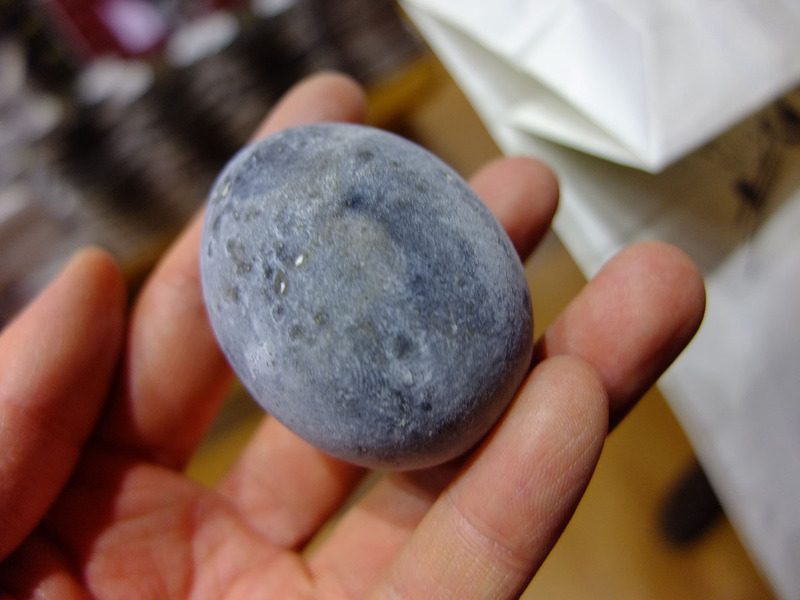 It’s said that eating one of the black egg will add seven years to your life. They’re sold in bags and 5 and I am very glad Y is around since there’s no way I am going to eat 5 eggs by myself (we ended up eating it over 2 days). When the trails were open one could walk up to the original black egg shop and one can watch how they dip the eggs go into the water white and come out black. 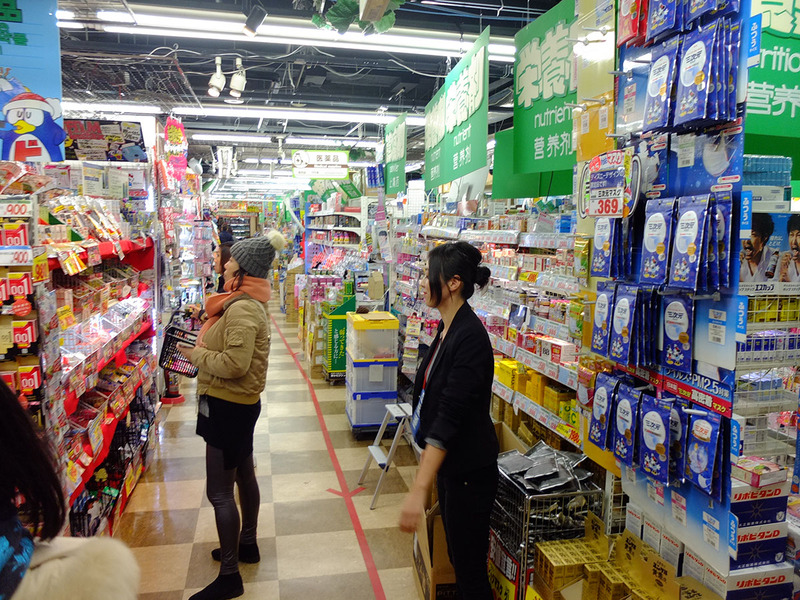 For now though just have to buy them at the store next to Owakudani station. I secretly hoped the clouds on Mount Fuji might move off during lunch time, alas no such luck. 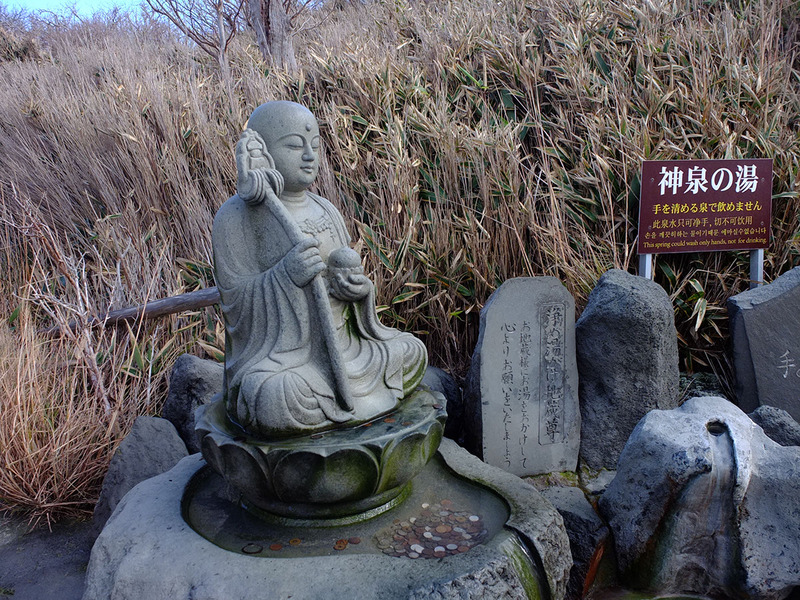 Time to continue onward on the ropeway toward Sounzan. The station was packed with people. 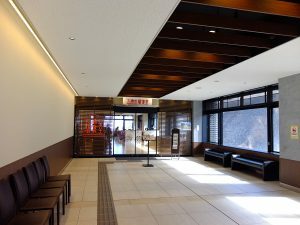 The line heading to Togendai/Lake Ashinoko had completely filled that side of the station, across the walkway and was spilling into the main station foyer. Goodness, thankfully we’re going the other way. 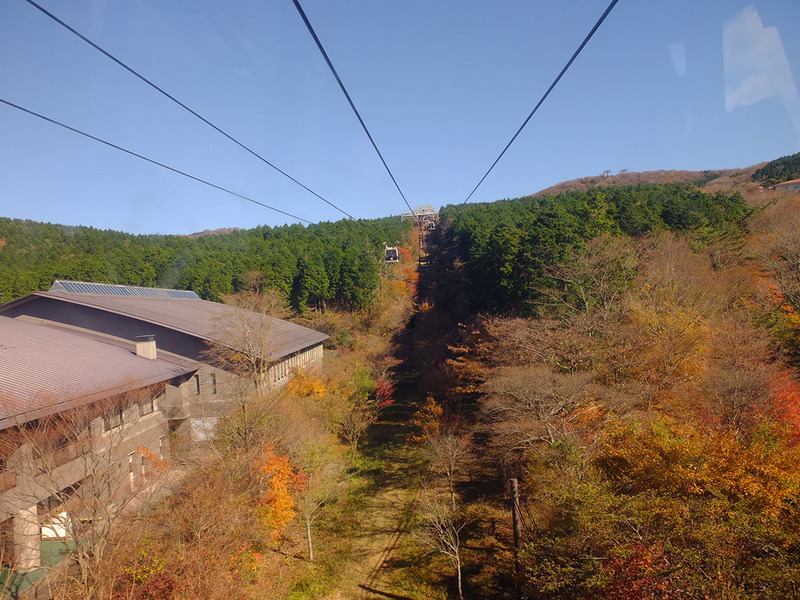 The ropeway to Souzan flew directly over the crater. For safety reasons they gave out medicinal towels to cover one’s mouth and nose incase people felt overwhelmed by the smell. 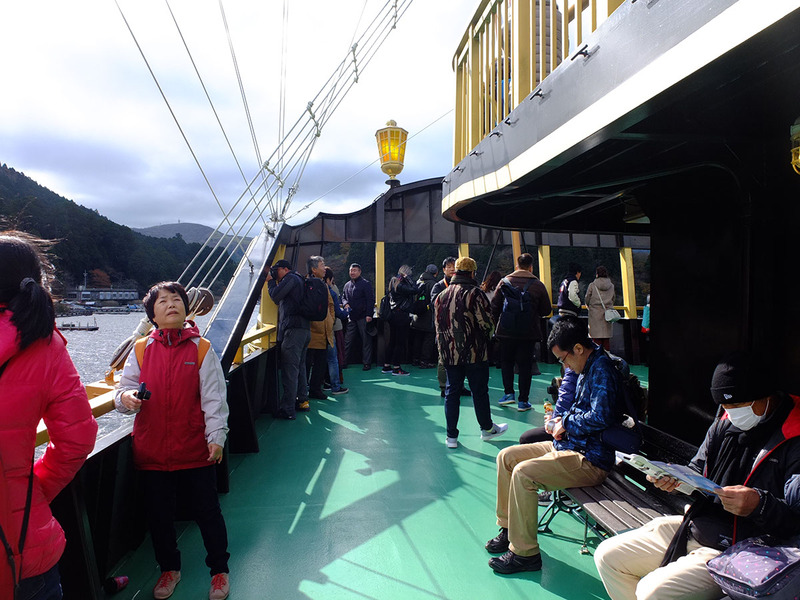 At Souzan there were even more people waiting to get on the ropeway toward Owakudani. I think people start to move toward Ashinoko after lunch to leave enough time to visit Hakone shrine. 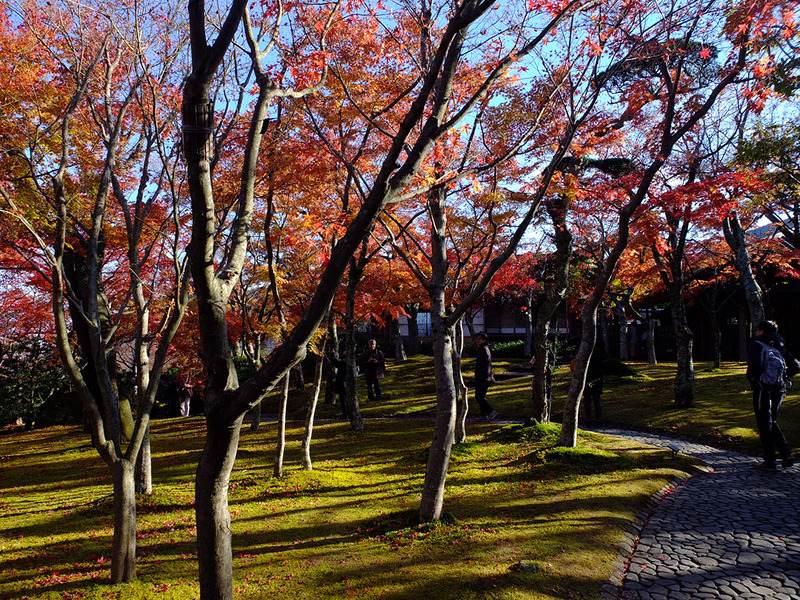 Between Souzan and Gora is one of the core areas of Hakone. 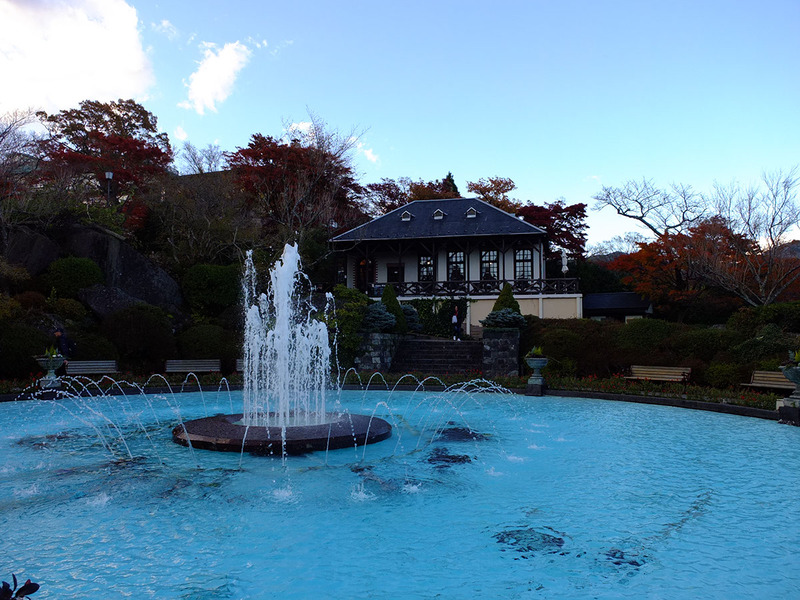 There are many hotels and ryoukans, and the bus routes connects out from here to nearby parks and museums. Despite just 1.2km as the crow flies between the two locations, there is an elevation difference of over 200m, requiring cable towed cars to climb the steep slope. Yet another reason to travel clockwise. 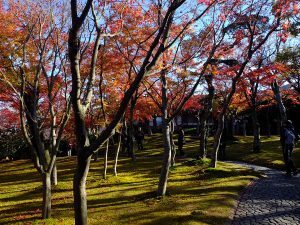 It is possible to walk downhill in the direction of Gora, while going uphill from Gora is going to work up a sweat even in the cold winter. The cable car is single tracked with a passing track in the middle. The towing cables runs down the middle of the track and I was very intrigued by how at the passing tracks the cables are directed down the respective sides without getting entangled. 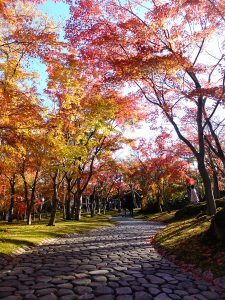 On either side of the track lined autumn leaves in full bloom of red and orange. 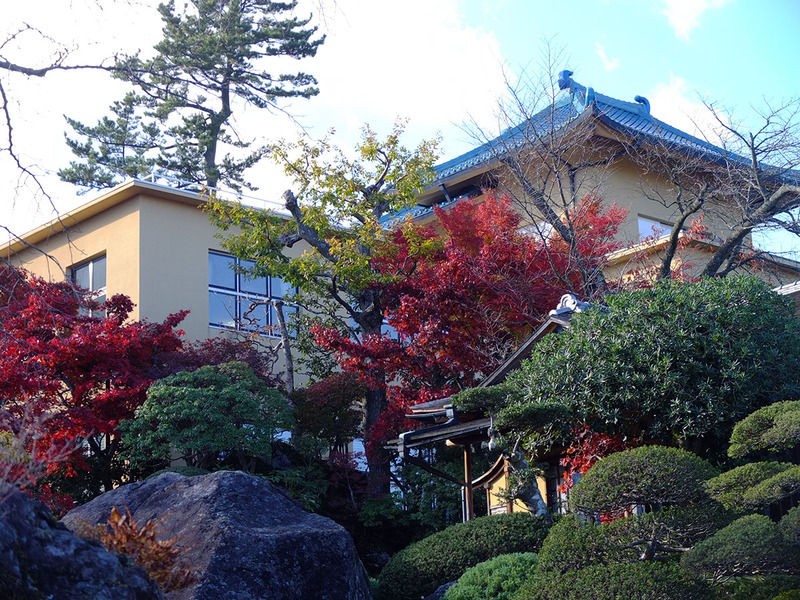 The main attraction for the afternoon was Hakone Museum of Art. 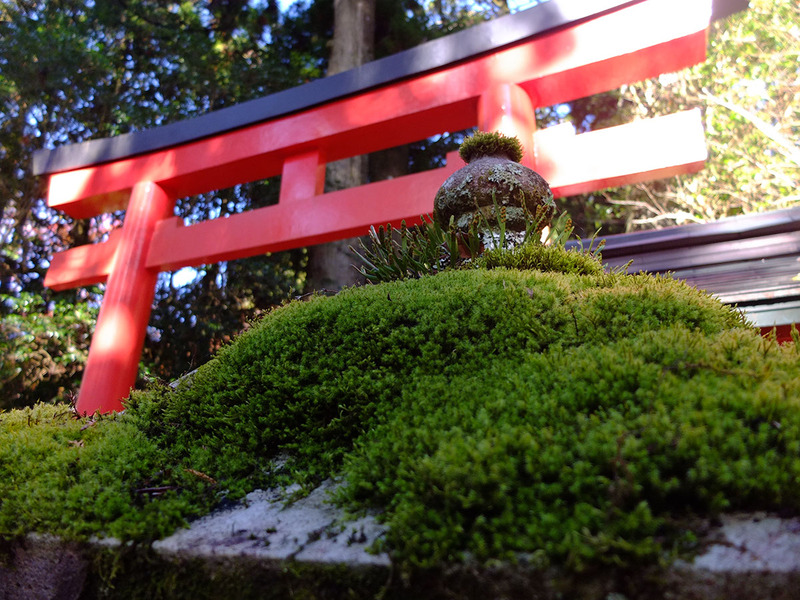 Hakone Museum of Art ironically was not most known by its collection but by its impeccably maintained moss garden. 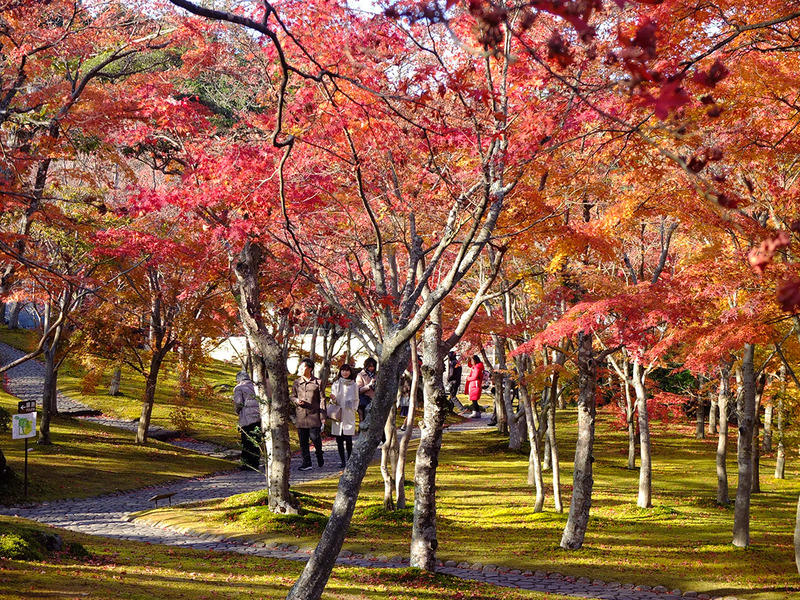 In autumn the red leaves in the moss garden is one of the most poster perfect scene of Hakone. The entrance was just across the road from Koen-Kami station. I had already bought the tickets electronically so we headed straight in. The museum grounds consists of roughly 4 parts in a loop. 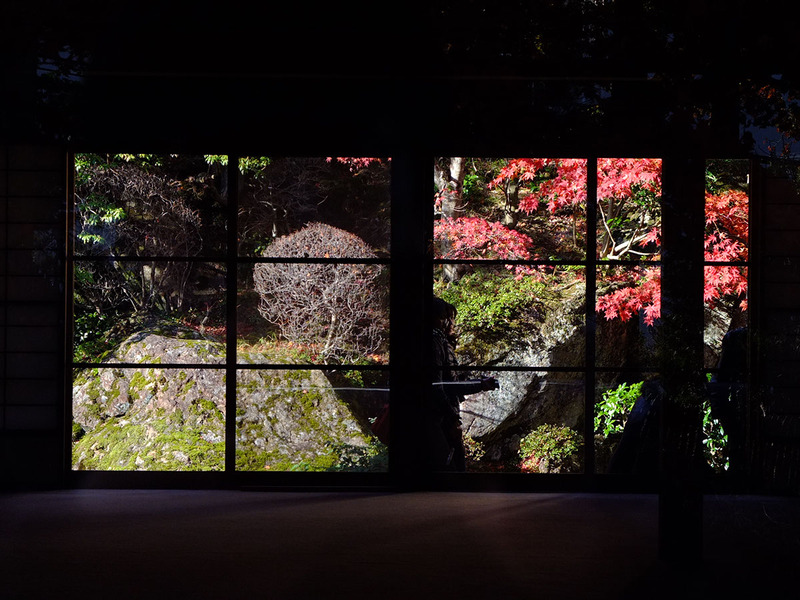 Going anti-clockwise, the museum building overlooks the entire garden, followed by the rock garden, the tea house, and the moss garden. The moss garden was the main reason for scheduling the trip at this date and I had watched the online photos intently for the past few weeks, checking the progress of the autumn leaves. For a while it looked as though we might miss the autumn leaves, even when they proved much more resilient I worried they might be half barren. 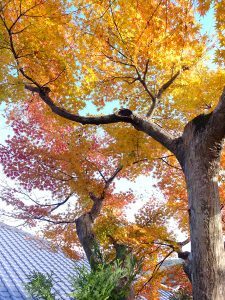 My eyes widened at the sight of the fiery tree tops. In rolling green seas winded stone paths like shallow reefs. 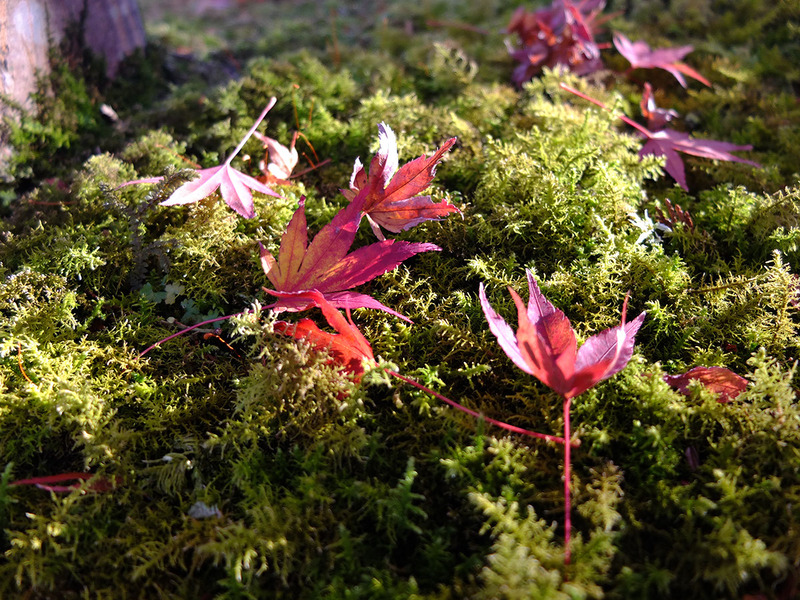 Fallen maple leaves laid quietly on the soft carpet in tranquil sleep. The burning canopy contrasted with the green moss below formed a beautiful dreamlike landscape. There was a constant stream of other admirers lost in the beautiful world like us. Just enough to not feel alone, not too many to be intruded. 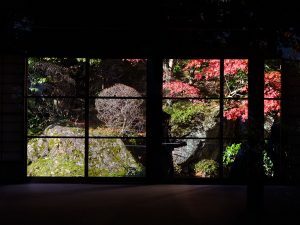 Since this place is ostensibly an art museum, one should definitely still check out its collections regardless of how mesmerized one is by its garden. There are 4 exhibition spaces, each about the size of a small auditorium room. 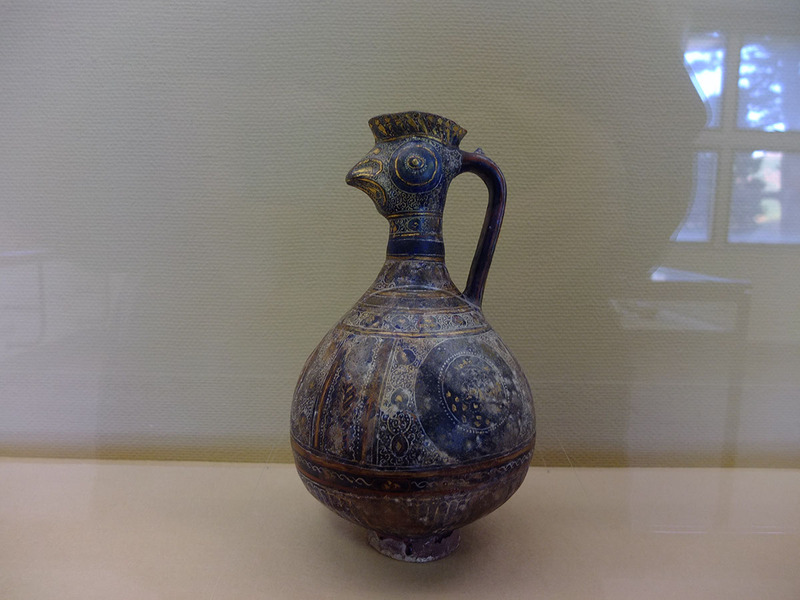 The collection is quite varied, being the personal collection of the museum founder Okada Kimochi. 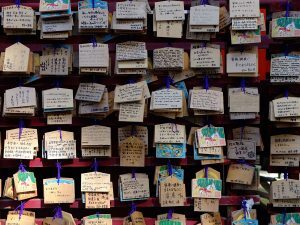 Okada was the founder of a new Japanese religion in the early 20th century. 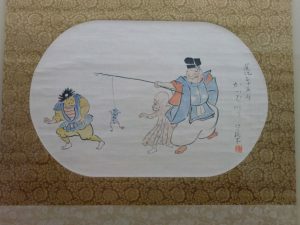 On display were many ukiyo-e, traditional paintings. Part of the ukiyoe featured scenes of the tokaido which Hakone as mentioned before was an important checkpoint on it. Upstairs were the ceramic exhibitions displaying buddhist statues and bowls, plates, jars, including flame jars from the Jomon period. There was still light, though the sun had fallen behind the peak and we were in the shadows. Our next stop was the nearby Gora park, free entry with the Hakone pass. I got a little confused with the map, despite there being an entrance on the topside right next to the art museum we ended up going down to the bottom main entrance. The park was a western style garden best known by the giant fountain at its centre. It was hard to get a good judge of the gardens in the fading light. Other than the gardens, there was a restaurant/cafe overlooking the fountain and several craft houses where one could participate in glass blowing, dried flower arrangement, glass etching. 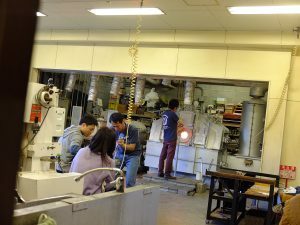 The craft activities takes from 30 min to an hour and a few thousand yen, though some have to be delivered to the hotel a few days later due to the need to either put it through the kiln or additional processing. 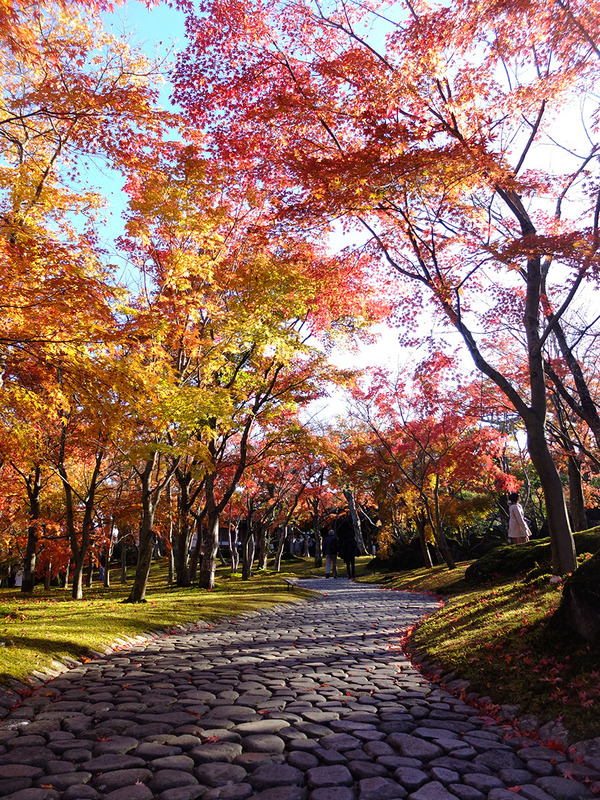 The garden is better visited in spring and summer when flowers are in bloom. Time starts to slip in the twilight. It was still about 3:30pm but was starting to feel like 5 or 6pm. We wandered down to Gora station. There was a tofu shop behind the station that was somewhat well known. I mulled over whether it’s worth the trouble going there. Y wasn’t that interested either so we only looked about the station front then lined up to head down to Hakone-Yumoto. I had known that the trip down would be problematic. 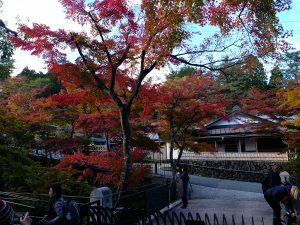 Normally the bus trip would be 20min faster than the mountain train but during the autumn leaves season the road gets backed up all the way from Odawara to Kowakudani. I however did not expect the train to be also so packed that we were not able to get on the first train and had to wait another 15min for the next one. Travelling in Hakone during peak season requires a lot of patience and lead times in the schedule, potentially queues everywhere. The street of Hakone-Yumoto was a little disappointing. 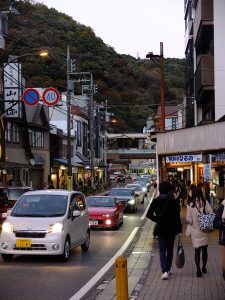 The main issue was that the busy road was filled with cars and the sidewalks was too narrow for the number of people and became difficult to walk or to see the shops ahead. The street was not very long, maybe just a hundred metres, more of a shopping street than an onsen street, much less souvenir shops than would have thought. Part of it may be that Hakone isn’t known for any local specialties so the shops are more croquette shops, sweet shops, cake shops…etc. We tried to look for a place to eat but did not find anyplace too appetizing. 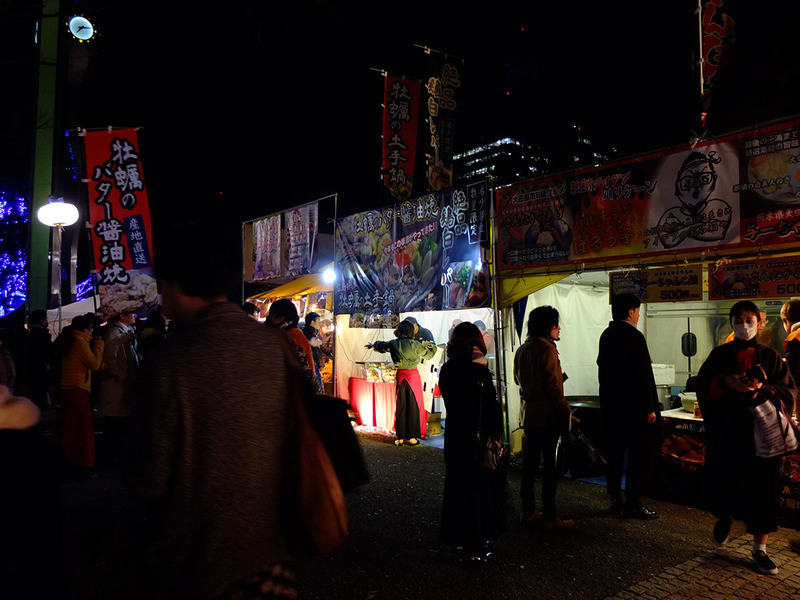 There are eateries in the backstreets, though I was not keen on possibly wasting effort looking. I think both of us were getting a little tired. 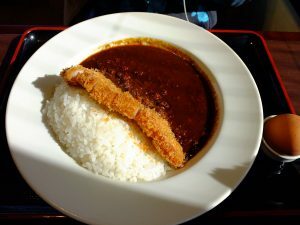 The original dinner plan was Curry Cocoro, that only opened at 5:30pm, still some time to go. The alternative was to head back and see what we can get at Odawara or even back in Tokyo at Shinagawa. 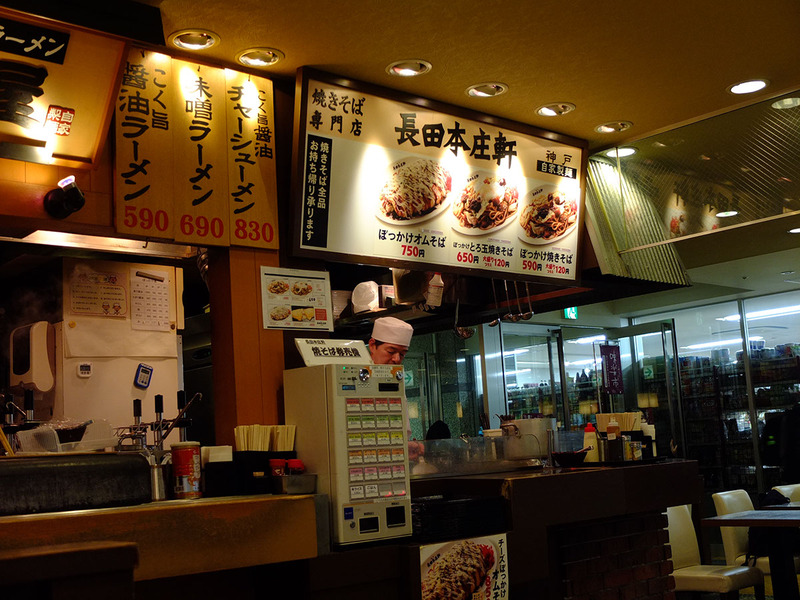 We ended up eating at Odawara station while waiting for the next shinkansen train. Inside the shopping arcade at Odawara station there’s a small foodcourt specializing in noodles. There’s ramen, udon, sobas. We ended up getting yakisoba. We whizzed back to Shinagawa in less than 30min. 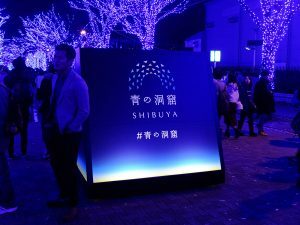 Along the way we decided since it was still early, we’d go to Shibuya to see the Blue Cave illumination there. 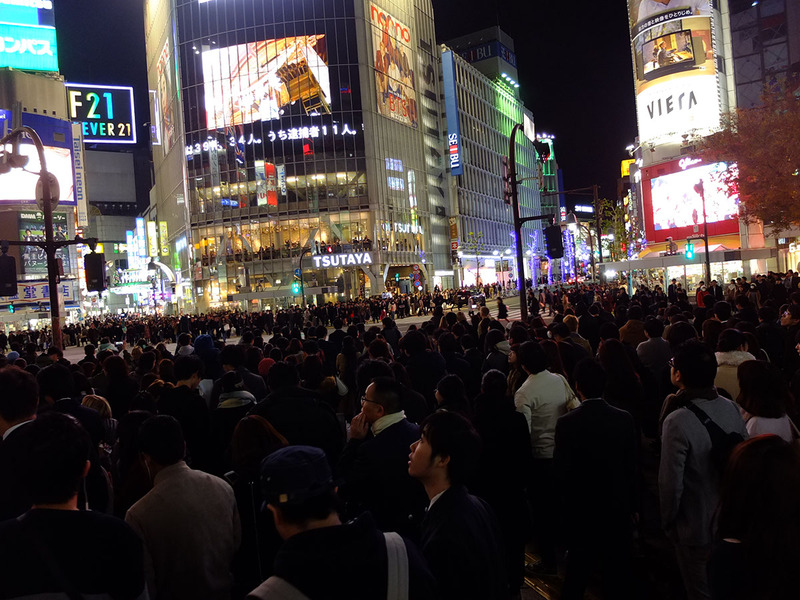 And.. right into Yamanote line during the evening peak hour. Should have seen that coming and planned accordingly. The carriage was packed tighter than sardine. People gripped the top of the doorframe to give themselves leverage to push onto the train. Just when one thought the train could possibly fit no more, somehow another five people would skillfully push themselves in. At the intermediate stations I have no idea how people squeezed themselves off the trains. The train had to pause for extended periods while the station attendants asked for people to stop trying to get on and wait for the next train. Thankfully we were getting off at Shibuya which was not too many stops away and plenty of people would be getting off that we only needed to go with the flow. It was an experience, though one me and Y both agreed best to never have again. 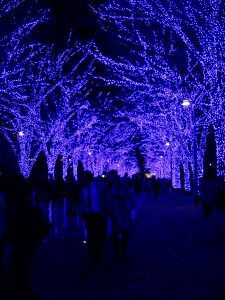 The Blue Cave was at Yoyogi park, where the trees along the main walk were strung up with blue christmas lights, and the pavement was covered with reflective boards to create a scene of mirrored lights. 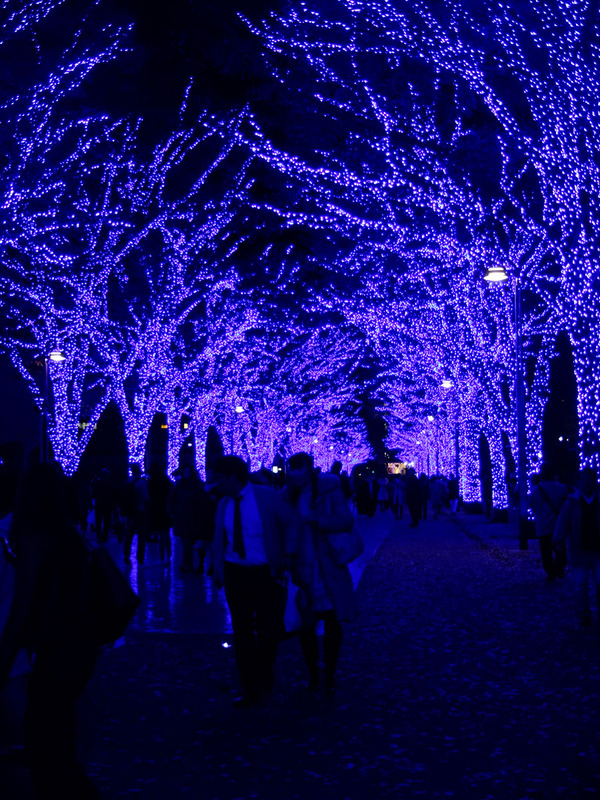 The streets between the station to the park was also decorated with blue lights, creating a guideway through the busy shopping district. The Blue Cave area was filled with people basking in the luminescence. A little hard for the reflection to be seen in its full elegance. At the end of the Blue Cave was a food event called Oedo Japanese Feast, some 30 stores selling all kind of nightmarket foods like grills oysters, crabs, steaks, skewers..etc. 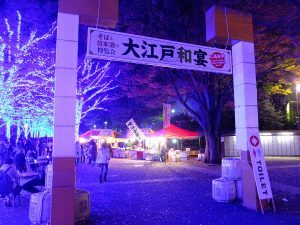 Despite being sponsored by the Japanese Sake association there was no stalls selling sake in sight. 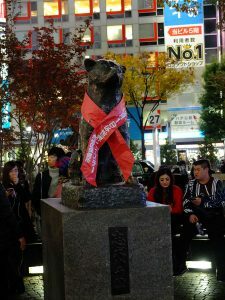 Time to head back to Shinbashi. Shibuya is connected to Shinbashi directly via the Ginza line, it also won’t be as crowded as the Yamanote line. The Ginza line station at Shibuya was under re-construction and we were led into climbing up 3 storey tall flight of stairs to reach the platforms. Tokyo stations is known to be terrible with accessibility but this was the first time I’ve thought things to be ridiculous. The least they could have done was show a map pointing to the elevator or escalators. Still not very late, I suggested we go to Don Quijote nearby. I had alway heard a lot about the discount variety store but never did go to one, in part because of my habit of going to rural areas and also because I’m not big on shopping and saw no need to go to one specifically. 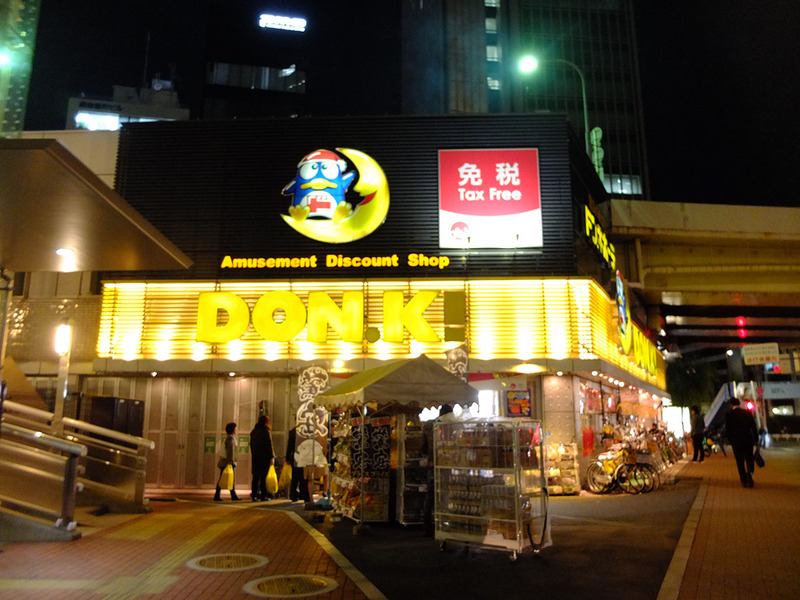 The store, turned out to be nothing like what I had seen before. 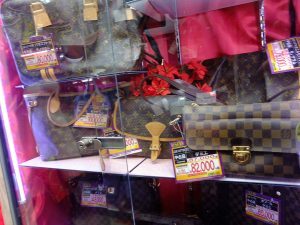 It sold everything, from the expected sweets and cookies to some downright bizarre items like second hand Burberry bags. 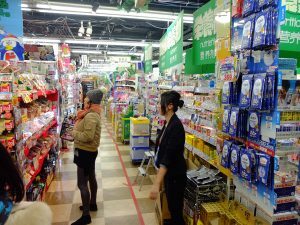 Cosmetics, small electronics to appliances like rice cookers and the ever in demand hairdryers, strange toys, stationary, cameras. While Y went to do some pricing research on alcohols, I lost myself in a strange world of exotic cookies, 10 different flavors of kit kat (sake kit kat??) 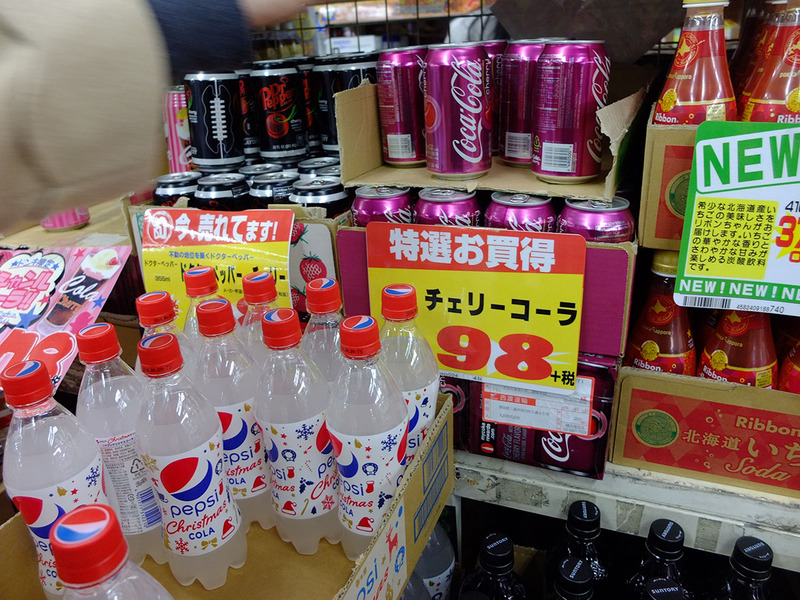 and the unseen flavors of white pepsi and cherry coke. Couldn’t tell whether things here are good bargains or not like it’s said on the net, it’s very fun to just see what craziness gets concocted. 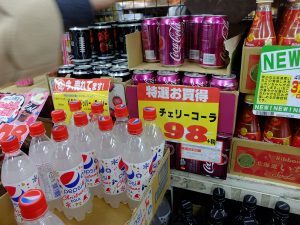 I ended up getting two cans of strange flavoured cokes (they were terrible), a bottle of juice cocktail (this one is okay) and a pack of mochi sweets to bring to work (surprisingly good). All in all a very filled and exciting day. Could have spent a little longer at Gora, maybe even allocated some time to do some handicrafts. 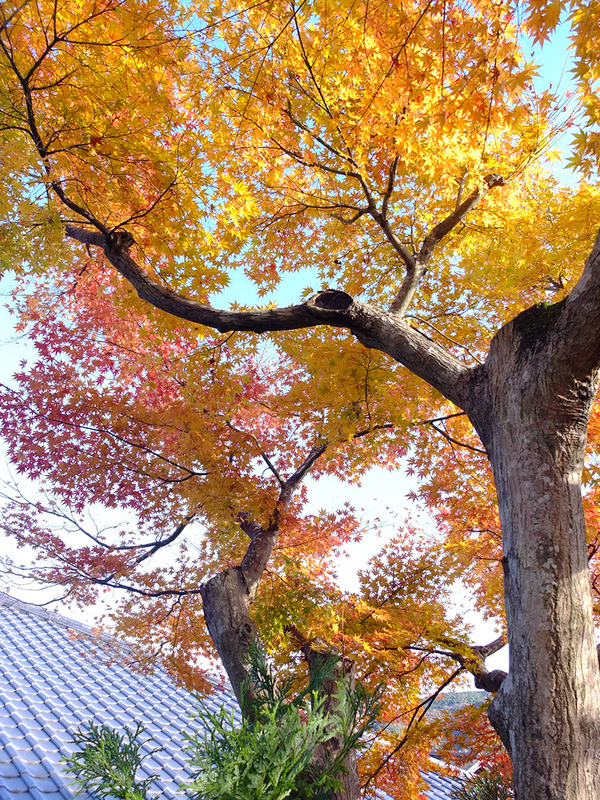 Got to saw Mount Fuji and the autumn leaves, very happy with that.